That’s me you have seen marching double-time through the streets of New York’s Little Italy, my eyes glued to the pavement, determinedly dodging the catcall invitations for free sangria and heaping bowls of pasta. So it is not surprising that I never noticed the Alleva Dairy cheese shop snuggled at the intersection of Mulberry and Grand Streets; according to friends of mine who have been visiting the shop since the ‘80s, I’d been missing out. 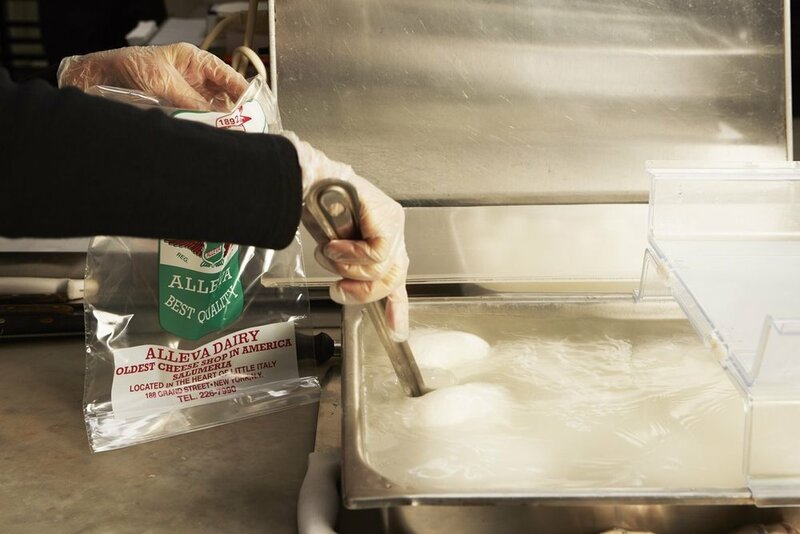 Nothing about Alleva Dairy is subtle: the façade screams “Ricotta,” “Mozzarella,” “Oldest Cheese Store in America,” “EST.1892,” and the windows are cloaked with neon signs. 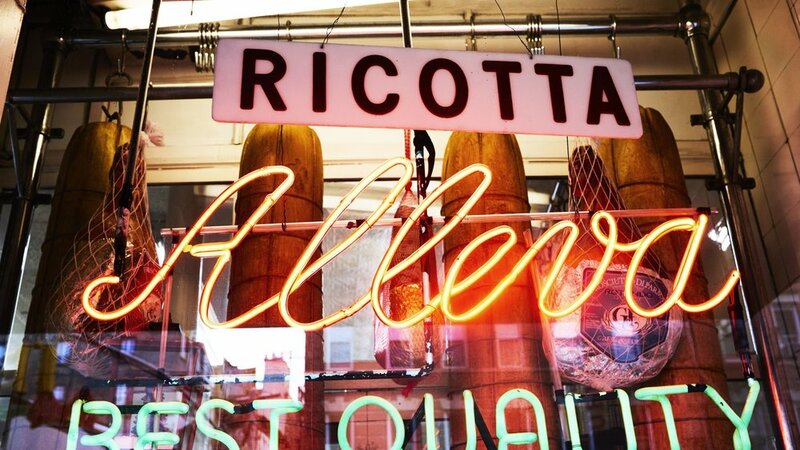 Brace yourself for sensory overload as you step into the shop and onto the lovely Italian tiled floor. Dangling legs of Prosciutto drop from the original tin ceiling and stacks of cheeses teeter on the oversized deli counters. It’s delicious chaos. “This is authentic Little Italy,” says co-owner Tony Danza as he escorts me from counter to counter. Yes, I am talking about the famous TV actor Tony Danza. Danza bought a part of Alleva three-and-a-half years ago, when his best friend Cha Cha got wind that the previous owners were going to exit and sell the business. “It feels like my mission to keep this piece of my Italian-American history alive, as the face of old New York disappears,” he explains. It’s lunchtime on a Thursday and the store is bustling with people on their tiptoes shouting their orders for Alleva’s famous hero sandwiches. The shop makes nine special heroes, including the “San Gennaro” and the “Alleva,” but naturally one of the most popular is the “Tony Danza,” stuffed with roast beef, Swiss, hot peppers, lettuce, and spicy mustard.